Switzerland and the US are the most secretive major financial centers in the world, according to a global ranking compiled by a group campaigning for more transparency. 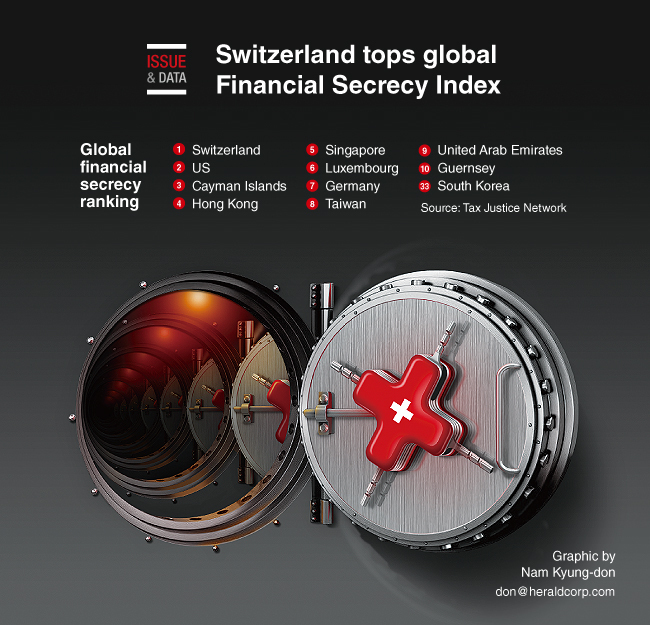 The Tax Justice Network’s study found Switzerland to be the “global capital of bank secrecy.” The US ranked second because its share of global offshore financial services has increased steadily. The study, which is published every two years, looks at countries using several criteria including how much information they provide about the ownership of trusts or foundations and the degree to which they respect money-laundering rules. The Cayman Islands ranked third, followed by Hong Kong, Singapore. South Korea came in 33rd out of 112 jurisdictions.